AMHERST, Mass. (May 22, 2003) -- Raise your hand if you've been looking for a reasonably priced, center-shafted, heel-weighted, face-balanced putter. According to Tour Edge, until now all of you with your hands in the air (put them down now) have been out of luck. The company's Equator putters are billed as the first flat sticks incorporating all of these design features. Tour Edge founder and president David Glod says, "In my opinion, the Equator is unlike any other putter on the market." Glod goes on to list the "Equator's optimal balance, top alignment aid, and no-bend, center shaft" as the key innovations. 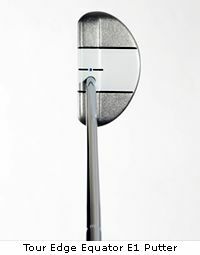 A 100-gram tungsten plug positioned on the bottom of the heel of the putter head lends the Equator its heel-weighting. The purpose of this plug, which accounts for 30-percent of the putter's weight, is to allow the face of the putter to "keep up" with the shaft. Ideally, this remedies a common problem with center-shafted, no-bend putters: a tendency to have an open face at impact. The low position of the weight also puts the vast majority of the putter's bulk below the equator of the ball, greatly reducing skidding upon impact. Finally, there is a white, ball-width stripe perpendicular to the face along the top of the putter head, which is supposed to help with alignment. During several visits to the putting green at Hickory Ridge Country Club in Amherst, Mass., (hickoryridgecc.com), we passed the Equator E1 (mallet) around to golfers of varying skill levels to get their impressions. Despite Tour Edge's proclamations of technological advances, most players took the putter to be a fairly standard mallet. Some at first mistook the white alignment aid, which extends down onto the face of the club, as an insert, and they felt misled a bit when they discovered it was not. With softer golf balls, every golfer noticed a pronounced lack of skid at impact. The ball appeared, as far as we or they could determine, to begin rolling immediately off the face. Harder balls came off significantly "hotter," but also with very little skid. Traditionalists liked both the center shaft and the lack of an insert. An assistant pro noted that the clean, conservative lines would appeal to traditionalists. The face looked a bit stubby to some, possibly because of the width of the mallet head front-to-back. The tungsten plug appeared to have passed one test with flying colors: No one ever seemed to push a putt with the Equator. In other words, the face seemed to close nicely, as billed. On the other hand, a few golfers pulled a number of putts, indicating a closed face at impact. So golfers who tend to pull putts regularly might want to be wary of the severe heel-weighting. Everyone gave the Equator an A+ for appearance. The bold blue coloring (including the soft grip), clean lines, and helpful alignment aid - all the cosmetics come together nicely. The blue, zippered head cover is even sharp! 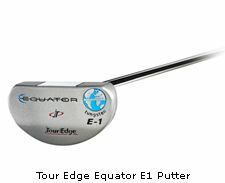 Although we have yet to carefully research the claim that the Equator is the first putter incorporating all of the features listed earlier, we do find it to be a solid putter at a reasonable price (MSRP $119). The tungsten weight works to impart exceptional roll off the face, but it can also have the effect of over-rotating the clubhead and promoting pulls. Overall, though, the feel and quality make it an excellent option for discerning golfers looking for a novel combination of tried and true design features. For more information go to touredge.com or phone (800) 515-3343. 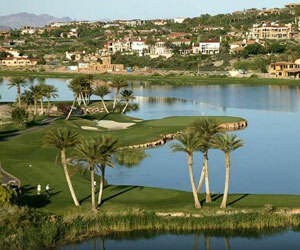 This package includes 3 nights in your choice of our partner hotels and a round of golf at these great golf courses: Reflection Bay Golf Club TPC Las Vegas and Royal Links Golf Club for a total of 3 rounds of golf, starting at $799.